This post aims to provide an expanded guide, including some of the more exotic ways you can get value out of Vary in intermediate caches like Fastly. One of the most popular articles on the Fastly blog is my colleague Rogier “Doc” Mulhuijzen’s “Best practices for using the Vary header.” It was published in 2014, and since then some Fastly customers (including my former employers at the Financial Times and Nikkei) have started using Vary for everything from A/B testing to internationalization, in increasingly creative ways. But at the same time many people still use Vary badly or misunderstand what it does. A Vary response header tells caches that a particular header (or headers) from the request should be used to construct a secondary cache key that must match in order to use the cached response to answer subsequent requests. If that sounds like alien nonsense to you, you’re not alone. The best way to understand it is by looking at an example. We then try to find an object in the cache that matches this key. This fails, because we don’t have that object in cache, so we send a request to your origin server. Your application sees that the request does not include an Accept-Language header, so you use your site’s default language. You’d obviously prefer to serve the right language if you can, so you don’t want us to serve this response as a cache hit if a future user requests a specific language. To avoid this you include Vary: Accept-Language in your response headers, even though none was specified on the request. Back at Fastly, we receive your origin response, notice your Vary header and copy the value of Accept-Language from the original request into a “vary key” for your response. Since there wasn’t an accept language on the request, the vary-key for this cache object will be an empty string. Although the response we have in cache matches the cache key generated for the incoming request, it doesn’t match the vary-key (because “” != “ja-jp,en;q=0.8”). So this is actually a miss; we’ll send this request to your origin server. Since the key has to be recomputed for each cache object, this is much less efficient than using the vcl_hash function, which is why we limit each cache object to 200 variations. In practice, all the cached objects for the same URL should in most cases have the same Vary header (as they do above), and later we’ll come to what happens when they don’t. Important: one of the reasons that people find Vary hard to understand is that the value of a Vary header is not a key, it’s an algorithm for generating a key. While the key itself will differ for each variation, the method of generating it could be the same (but doesn’t have to be). If your origin server’s response depends on the value of a request header (including the absence of it), then include that header name in a Vary response header. Don’t vary on things that typically have many possible values, like User-Agent, because it will create too many variations, you will have a very poor cache hit ratio, and you’ll quickly hit the 200 variation limit. Use the same value of Vary for variations of the same URL. Accept-Language is a great example of using Vary well, and it’s frustrating that too often developers choose to instead use geolocation as a proxy for language choice. Just because I’ve physically travelled to Japan doesn’t mean I suddenly speak Japanese (I really wish it did). My browser is telling you which languages I speak, so you should use that data, not my physical location. All browsers send this header, so there’s no reason not to use it. Thanks to dense interconnects between European countries, Frankfurt serves a wide area of Europe and may be the optimum POP for users all over the continent. As a result, English still tops the list, with a variety of European languages making up the rest. In contrast, POPs in the US disproportionately receive requests for English, Spanish, and Portuguese, and POPs in Japan unsurprisingly are asked to speak Japanese. The list above is messy — case differences, random combinations of different possible languages and priorities. The top six requested languages in Tokyo are all Japanese but just slightly differently phrased. Headers on which we vary often have a long tail of possible values, including garbage values, which will destroy cache performance. In the earlier example above, we saw a vary-key of “ja-jp,en;q=0.8”, which includes not just the main language, but also the variant (Japanese as spoken in Japan), a second choice (in this case English, any variant), and a priority (0.8). This is all pretty specific to the user making the request, and other Japanese users might have slightly different settings. Added to this, our origin server might not actually support Japanese. If an inbound request specifies Accept-Language: ja-jp,en;q=0.8, then the above code would transform that header into: Accept-Language: en, because the user is OK with English, and our backend server doesn’t support Japanese. This is great, because now that the request has been redefined, the origin can respond with an English response and we will cache that with a vary-key of simply “en”. Even for the case when an incoming request has no Accept-Language header, this normalization process will add an Accept-Language: en header, meaning that we’ll only cache one copy of the content for each language that we support. Using VCL, Fastly customers can add extra headers to a request before forwarding it to an origin server. Can the origin server Vary on those headers, even though they are not sent from the browser? Yes! But there are a couple of important considerations. However, unlike the Accept-Language transformation, which just slightly cleans up a header that the browser originally sent, this Vary rule acts on a private header, and is meaningless to the web browser. To avoid this being a problem, we need to transform the response in the Fastly vcl_deliver stage, before sending it back to the browser. If we don’t do this, the user could sign out and continue to see pages intended for logged-in users, because without a Fastly-UserRole header in the request, the browser will match a previous response for any role. Notice that while this Vary value has resulted in us correctly storing the different variations of the A/B test buckets, we’re also storing one copy of the anonymous-user homepage for each test bucket as well, even though all anonymous users get the same experience regardless. Almost anyone that knows anything about Vary will generally tell you not to do this, and it does depend on the ability of the cache to evaluate vary-keys in a deterministic way and to not implement any optimisations that assume all variations will use the same header set. I have not tested all caching proxies, so be warned (though I can clarify that this technique works perfectly well with Fastly). Since Vary is a mechanism for distinguishing cache objects with the same URL, there are other ways we could do the same thing. The most obvious of these are to use distinct URLs behind Fastly, or to change the way we compute the cache key to include something other than the URL. The main difference between these techniques, and using Vary, is how each party in the pipe separates the variations. Doing this in vcl_recv means that each variation of Accept-Language in the request will result in a different URL being looked up in the cache and presented to your origin server. The only place where the variations occupy the same URL is now in the browser. You still need to use Vary on the response from Fastly to the browser, and because your origin server is probably not adding it (since it doesn’t apply to the origin response) you will need to add it in vcl_deliver using Custom VCL. The URL manipulation will apply to every request, unless you write more complex VCL to limit it to only URLs that match a pattern, for example. This puts some of the separation logic in VCL and some in the backend, which is often a messy architecture. If you send a purge request to Fastly, you will purge only one of the URLs, since they have separate cache keys and Fastly doesn’t consider them variants. Normally, varied responses with the same cache key are all wiped with a single purge for that URL. This is similar to transforming the URL: since the URL is one of the components of the standard hash algorithm, transforming the URL is essentially modifying the hash too. The difference is that unlike the URL transform, modifying the hash algorithm directly means that the URL presented to the origin server remains unchanged. I don’t like this, because it puts your origin server in a strange situation — it will use the Accept-Language header to generate responses for each language, and Fastly will cache them separately, but the origin need not advertise the variation with a Varyheader, because if it does, Fastly will include the language in both the cache key and a vary-key too. There’s no significant performance downside to this but it feels to me like something that will come back and bite you later. 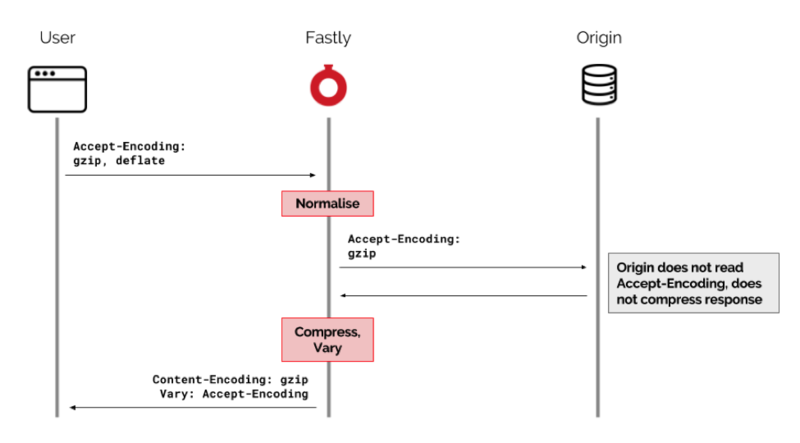 Varying on Accept-Encoding is by far the most common use of Vary, so Fastly normalizes the Accept-Encoding value automatically. The value will be transformed into a single token which is currently either ”gzip” or an empty string for no compression support (if you’re wondering about Brotli compression, see this community post). We’ve covered already the benefits of normalizing request metadata before using Vary on it, and this takes that principle one stage further by normalizing to a value that can be understood as a transformation that can be done at the edge itself, so your origin server need not create any variations. Vary allows distinct variations of the same content to be cached against the same URL, and chosen based on the value of some request header. It’s most often used for Accept-Encoding (gzip / no-gzip), and should probably be used more for Accept-Language. Currently it’s not very useful to vary on other request headers from the browser, but transforming them at the CDN can produce additional useful values in private headers. You need to be very careful about which responses you include Vary on, and why, and for the most part always use the same Vary value for the same URL unless you really know what you’re doing.